After two teachers’ strikes in as many months in California, it is too soon to tell whether the labor disputes in Oakland and Los Angeles presage a new era of school-based activism. But regardless of what comes next, this year’s strikes had much in common, and yielded valuable lessons and insights for other districts where labor troubles may also be brewing. Both strikes were relatively short, lasting about a week. The timeline was shaped by the troubled finances of both districts that couldn’t afford to lose excessive amounts of state funds they receive based on student attendance. Teachers also couldn’t afford to lose excessive wages by being out on strike for a lengthy period, or to take money off the bargaining table that could have been used to meet some of their demands. So there was pressure on both sides to resolve the strike within a reasonable amount of time. In both cases, teachers appeared to come out ahead, achieving gains they might not have won without a strike. In Oakland’s case, teachers earned a gradual salary increase of 11 percent — more than double the 5 percent the district offered before the strike began — although most of the gains will only come in the 3rd year of the agreement. In the case of Los Angeles, on the salary front teachers got less than what they demanded initially, and settled for the 6 percent the district had already offered. But they did get commitments from the district to reduce class sizes and significantly increase support staff like counselors. In both Oakland and Los Angeles, the strikes demonstrated deep public support for the teachers. It suggests that the days when teachers were held solely responsible for seemingly every shortcoming in the state’s public schools, along with the success or failure of their students, are over, at least for now. In both conflicts, the teachers unions and their allies are looking to Sacramento, as well as voters, to approve more funds as a key element in making the agreements enforceable. But it is not clear where those funds would come from. Neither Gov. Gavin Newsom nor the Legislature has made any commitments beyond the funding increases that Newsom requested in his proposed budget in January. In Los Angeles the strike did push the school board to place a long-delay tax on real estate parcels on a June 4 special election ballot. If approved, it would help erase the district’s projected $500 million shortfall. Whether it will pass is another matter: it will require voters to approve it by a two-thirds margin, which the last parcel tax measure nearly a decade ago failed to get. Unaddressed in both Oakland and Los Angeles are deeper structural issues, such as the impact of declining enrollments, the crushing costs of meeting pension obligations, and stratospheric housing costs. Whether these underlying forces will trigger further strikes — still a relatively rare event in California — is hard to predict. In only one other California district — San Ramon Valley Unified centered in Danville, a wealthy suburban community to Oakland’s east — have teachers actually authorized their union to call a strike if contract negotiations break down, although labor conflicts are brewing in other districts like Sacramento City Unified and Fremont Unified just south of Oakland. Those realities will make recruiting teachers an ongoing challenge, even as districts struggle to find teachers in key areas like math and science and special education. And it will continue to create churn in the labor force, with some teachers being tempted to leave so they can live in districts where living costs are lower — or to leave the profession altogether. That may help explain the surprisingly large proportion of teachers in Oakland — 42 percent — who voted against ratifying the agreement. This is one area where the Oakland strike outcome differed from Los Angeles, where only 18 percent of teachers voted against the contract. While making some significant gains at the bargaining table, many Oakland teachers sent a message that they were hoping for more. Louis Freedberg writes about education reforms in California and nationally, and is the executive director of EdSource. The unwisdom of the scheme, however, is already taking its toll on its plausibility. While the sheer weight of facts will nudge officials toward a more prudent course, it’s important for Californians to recognize in advance that the plan isn’t right for the state. To begin with, there’s the cost. Already, taxpayers are spending over $1 billion to fund preschool for 175,000 kids. Legislation introduced by Assemblyman Kevin McCarty, D-Sacramento, to expand preschool coverage to 100,000 additional children could cost up to $1.5 billion, according to EdSource. It was former United Nation’s Ambassador and U.S. Senator Daniel Patrick Moynihan who famously said “everyone is entitled to their own opinion but not their own facts.” That quote came to mind in the wake of American College Testing (ACT) releasing their latest batch of test scores revealing American high school seniors readiness for college. ACT reported that only 60 percent of high schoolers met collegiate success benchmarks in English, 46 percent in reading, 40 percent in math and 38 percent in science. Every category – yes every category – showed a decline from the previous year. Our schools are going backward and taking our students with them. Moynihan’s quote comes to mind because the American education establishment – I like to call it the Blob – tries to obscure continuously falling and failing test scores with a dust storm of opinions from “experts.” ACT doesn’t deal in opinions of any size, shape or form. They deal in facts, and in this case the adjectives “cold” and “hard” are exceptionally appropriate. The cold hard facts are that only 36 percent of our seniors met “college ready” benchmarks in all four categories tested. That means almost two-thirds of our students are on the path to failure once they get to college. The cold hard facts are that the establishment is dysfunctional for millions of America’s students, and is giving the worst education to those most in need, as Hispanic and African American students continue to lag behind their peers in every category tested. This is academic malpractice. Moynihan was a fairly doctrinaire New York liberal for his times, but a thoughtful one never constrained by ideological straitjackets. He was an early and vocal supporter of school choice. The concept – which now applies to a number of opportunities states have created to expand options for students outside of their ZIP code – was a favorite of Moynihan’s. Moynihan passionately believed in giving parents the power to guide their kids’ education. He would be appalled that the ACT scores show that Hispanic and African-American students continue to lag behind their peers in every category tested. All of America should be equally appalled. For 25 years now the Center for Education Reform (CER) has sounded the alarm about falling test scores and failing students. We believe, and statistics show, that we must transform education – not just tinker with systems and not just give parents more options to choose outside of their zoned schools. That is necessary but not sufficient. No,we must truly redesign the process and what we expect from educators, students and yes, the Blob. Education must become personalized to every child, every student. The vision for a 21st century education system, well articulated by iNACOL’s Susan Patrick, challenges us to use our tools & modern day technologies to help students achieve competency, not just finish a grade, before moving on. “Moving toward a competency-based education model requires fundamental shifts in the systems, structures and assumptions that the traditional model of education is rooted in. We need bold leadership to transform K-12 education systems and policy. We need to build collaborative and distributed leadership at all levels of the education system to lead this transformation,” says Patrick. And that’s just the beginning. In the coming days CER will release its annual Parent Power Index (PPI), ranking the states on how much power they afford parents to drive their family’s education, and for the first time, taking a look at what states do to foster personalized learning, making schools student, not system centered. Such innovations in teaching and learning, along side the critical lever of expanded education opportunity so that no child is confined to a failing school because of their zip code, are critical to our nation’s future if we are to arrest the lagging education indicators that inhibit a productive future for tens of millions of Americans. As our nation moves toward yet another election, these issues should guide everyone’s decisions. Without informed and bold lawmakers at every level, we simply won’t change the status quo. I think Daniel Moynihan would agree. These are not opinions. They are facts. Jeanne Allen is the Founder and CEO of the Center for Education Reform. Cox seemed to suggest in a statement to the newspaper that he engaged in some hyperbole: “Of course our teachers will never approach the pay of a Beyonce or a Lebron, but quite frankly, our classroom teachers influence, inspire and change the arc of more lives than even these music and athletic superstars.” But his idea of instituting a form of merit pay makes a lot of sense. Despite the naysaying, every successful enterprise is, to some degree, competitive. Merit pay is a simple concept. It allows school administrators to pay good, effective teachers more than mediocre or poor-performing teachers. It allows signing bonuses and performance-based rewards. The obvious corollary is that it also allows them to pay bad or incompetent teachers lower salaries. In a truly competitive educational model that goes beyond this simple idea, school officials could even – get this – demote, discipline or fire teachers who aren’t making the grade. That’s how it works in almost any private business, and even private schools. To make matters worse, it’s nearly impossible to fire public-school teachers provided they show up for the job. School districts have “rubber rooms,” where teachers deemed unfit for the classroom twiddle their thumbs and collect full pay and benefits while their cases are adjudicated for months and even years given all the union protections against firing. It can cost school districts hundreds of thousands of dollars to go through the firing process, so most don’t bother. That leads to an annual, cynical process called the “dance of the lemons.” As Peter Schweizer explained for the Hoover Institution, “Often, as a way to save time and money, an administrator will cut a deal with the union in which he agrees to give a bad teacher a satisfactory rating in return for union help in transferring the teacher to another district. The problem teacher gets quietly passed along to someone else. Administrators call it ‘the dance of the lemons’ or ‘passing the trash.’” These cases usually involve teachers accused of some terrible action, but it’s functionally impossible to get rid of or pass along teachers who are merely incompetent. I recall when John Stossel showed a long flow chart of how to fire a teacher in New York City. The audience was stunned. Then Stossel, held up more pages of the chart. It’s crazy and the results are insane. In 2012, nine California public-school students filed a lawsuit against California and the CTA arguing that the state’s system of teacher protections violates the state constitution’s promise of an “effective” education. Los Angeles County Superior Court Judge Rolf Treu ruled on behalf of the students. He invalidated teacher tenure and other work rules because they assured that a percentage of “grossly ineffective” teachers would be left in the classroom, wreaking havoc on the future of many thousands of students, especially those in poor school districts. In his decision, Treu noted that “an expert called by (California school administrators), testified that 1 – 3 percent of teachers in California are grossly ineffective. Given that the evidence showed roughly 275,000 active teachers in this state, the extrapolated number of grossly ineffective teachers ranges from 2,750 to 8,250.” That’s a lot of bad teachers, and a depressing number of students who suffer in their classrooms. But Treu’s decision was overturned on appeal, and the appeal was upheld by the California Supreme Court. But the facts are the facts, even if the court was unwilling to back a decision to shake up the state’s public-education system. This is what happens when the educational system is not a “competitive endeavor,” but rather a union-controlled, government monopoly. It means that good teachers cannot be rewarded. Great teachers cannot easily be recruited. Grossly ineffective teachers cannot easily be removed. And mediocre ones have few incentives to improve. Imagine how this system would work in your particular profession or business. How well would it do if the worst are protected, the best are neglected and the so-so ones are rewarded? As a final note, the debate over merit pay reinforces the wisdom of the U.S. Supreme Court’s recent Janus decision, which declared that teachers and other public employees are not required to pay union dues even to support collective-bargaining purposes. Justice Samuel Alito, wrote for the majority that such bargaining often involved “fundamental questions of education policy,” so it’s antithetical to the First Amendment to compel people to support ideas to which they don’t agree. “Should teacher pay be based on seniority, the better to retain experienced teachers?” Justice Alito asked. “Or should schools adopt merit-pay systems to encourage teachers to get the best results out of their students?” Public-school teachers no longer are forced to subsidize the opposition to merit pay and to reforms to the current tenure and seniority based system, but there’s still a long process ahead to move toward the idea that Cox touted. From the Independent Financial Review Panel’s report of Los Angeles Unified School District emerges a dire picture that should alarm parents, educators and community stakeholders alike. It found that maintaining the status quo would grow the budget deficit to about $600 million by 2019–2020, concluding that failure to act would have real ramifications for the district’s 550,000 students including financial insolvency and even state takeover. For years district officials have avoided substantive reforms, but the warnings of distant fiscal calamity have now become a reality that leaders must address head-on. While the path ahead involves many difficult decisions and political headwinds, the process of right-sizing LAUSD presents an opportunity to lay the foundation for a 21st-century education system that’s productive, agile, and responsive to the needs of students and communities. In other words, right-sizing isn’t about budget cuts and layoffs, but rather optimizing all facets of operations with the goal of providing high-quality options to all students at a cost that aligns with revenues. To do this, LAUSD leaders should focus on five key reforms. LAUSD has little control over rising pension contributions because reducing these obligations requires state-level reforms. However, general staffing surges that are not supported by enrollment can increase pension costs, since the district must make pension contributions for each new hire. Further, LAUSD does have discretion over OPEB costs as well as health and welfare benefits for active employees. The district has several significant cost-saving options available to it, ranging from ending retiree health care benefits altogether to engaging in a variety of cost-sharing and cost-reducing strategies. 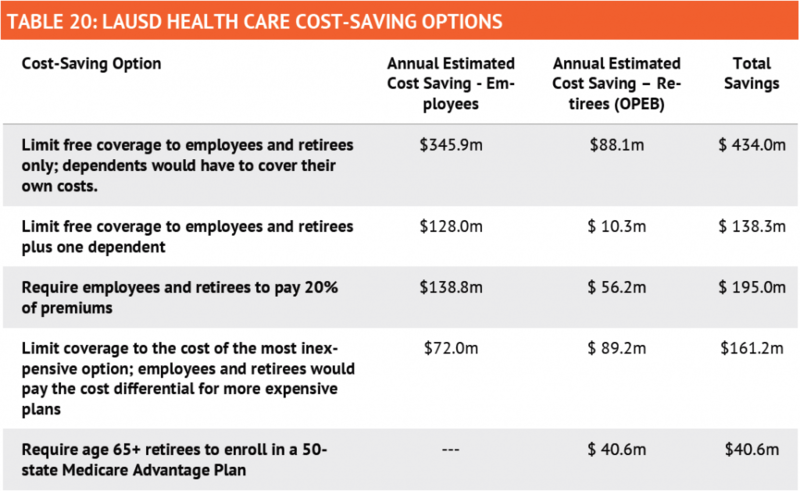 At its August 2017 board retreat on reducing health care costs, LAUSD staff presented five cost-saving options, as shown in Table 20. Ultimately the board upheld the status quo for health care benefits for another three years at an annual cost approaching $1 billion. Improve student attendance ($45 million): Because the state of California provides revenue based on Average Daily Attendance, LAUSD loses money with every student absence from school. Increasing the district’s attendance to just the statewide average—a relatively low bar to achieve—would generate an additional $45 million per year. Of course, this would not only help boost LAUSD’s bottom-line but also improve academic outcomes such as graduation rates and college and career readiness. In 2009–2010, Long Beach Unified shifted 10 of its social workers and counselors to working with campuses on truancy issues to increase student attendance. The chronic absence rate in Long Beach Unified dropped from 19.8 percent in 2011 to 10 percent by 2014. By 2015, the school district’s overall attendance rate was 96.17 percent up from 96.01 percent in 2014 and above the state average. Improve staff attendance ($15 million): Currently, only 75 percent of LAUSD staff members have strong attendance as defined by the district. Bolstering this number to 90 percent would save about $15 million on substitute teachers while also providing students with more stable classroom environments. To save even more money, LAUSD could require select administrators to substitute teach five days per year, a policy that saved Scottsdale, Arizona about 7 percent of their substitute budget and also allowed district staff to stay connected to the classroom. The reality is that LAUSD’s financial quagmire requires district leaders to make substantive cutbacks in both staffing and schools. Even though its declining enrollment has necessitated a reduction of about 10,000 staff, LAUSD has actually increased staffing levels in recent years while seeing costs associated with salaries and benefits also rise. This problem will only magnify if projected enrollment declines continue to hold true. To start, LAUSD must recognize that the lion’s share of new hires have been administrative staff, even during declining enrollment. Therefore, district officials should first evaluate every central office staff position as part of its school finance overhaul. Next, teacher layoffs are unavoidable but LAUSD can approach them in a manner that will help increase student outcomes even as overall staffing levels decrease. Importantly, district and union officials should work together to review and renegotiate factors that hamstring flexibility and do nothing to further student achievement, such as automatic pay increases, rigid staffing requirements, and termination provisions that favor costly teachers with seniority. For example, Boston Public Schools replaced a seniority-driven system by renegotiating its collective bargaining contract to give more autonomy over staffing to school leaders, and Hartford Public Schools’ contract now provides principals with more flexibility over things such as scheduling. Increasing district and school-level flexibility will not only minimize staff reductions and protect against future layoffs, but also help ensure that the district retains its highest-performing talent in the process. LAUSD should also follow the Independent Financial Review Panel’s guidance by offering early retirement incentives to senior staff and help reduce the percentage of teachers who have reached the maximum salary level, which is currently 10 percent higher than the state-wide average. Los Angeles also has declining enrollment without ensuring that all school sites are self-sustaining. While many other large urban districts with significant enrollment declines have worked to close and realign some schools to save money, LAUSD continues to keep under-enrolled schools open, even as it has opened many new schools over the last decade. In some areas of the district where school sites are very close to one another, the older schools have lost enrollment to newer schools. The district has not released a transparent recent report about the current capacity from one school to another or identified which schools may be under-enrolled and subsidized by the district. If we assume that LAUSD still has the capacity for 670,000 seats, then the current enrollment level of 500,000 students means that it is past time for the district to do a transparent audit of school capacity and how it might save money by closing the most under-enrolled schools. Independent charter schools have used some of this excess capacity for their students, but a transparent examination would ensure that the district can accurately assess all its financial options. In addition, evidence shows that closing the lowest performing and most under-enrolled schools can improve the quality of education for the most disadvantaged students. A growing body of research indicates that school closure increases educational opportunity so long as students have access to better schools. Closure students who attended better schools tended to make greater academic gains than did their peers from low-performing schools in the same sector that remained open. A new report on LAUSD’s real estate assets by the LAUSD Advisory Task Force calls for the district to “analyze the current occupancy of core District assets to determine whether consolidation of and/or relocation of certain tenants to more optimal locations could create savings, maximize revenue, and/or reduce functional obsolescence.” With a more thoughtful approach to managing individual school sites and vacant property, the district could actually raise money with long-term leases to charter operators or with other commercial or community uses of their underutilized real estate assets. In addition, school consolidation could help ensure every school has more qualified staff, rather than distributing LAUSD’s scarce resources over too many school sites. When LAUSD keeps open schools that are under-capacity, district-wide personnel may continue to grow while individual school communities feel staff shortages at the school level. This is because each school, independent of enrollment, requires a certain fixed number of staff positions, some of which may be vacant as enrollment shrinks. As the Los Angeles School Report noted in a May 2016 feature, former Superintendent Michelle King cited feedback from a principals’ survey she received that “showed principals expressing frustration with a lack of clerical staff, a lack of time to complete tasks and limited opportunities for instructional training. ‘Principals say there are not enough hours in the day to get everything they need done and improve teaching and learning due to a lack of sufficient personnel,’ King said.” In this way, the district can have too many employees that are unsustainable given the current level of enrollment and district revenue, while individual schools can also be under-staffed and stretched thin. But when schools consolidate, fewer fixed staff positions are needed and are more likely to be filled. The district is staffing too many schools at an inadequate level and could increase staff and school support at individual schools by consolidating and closing some schools. LAUSD needs to make a transparent accounting of site-based enrollment, spending, and revenue based on the students who are enrolled at each site, examine how each school uses resources, and determine how that impacts the district as a whole. Until that is accomplished, the district will continue to have too many staff members that are not effectively deployed to best serve the needs of students. Over a six-year period, LAUSD’s enrollment fell by nearly 100,000 students, about half of which is due to families choosing charter schools, with many others opting to enroll in traditional public schools outside of the district. With forecasted student attrition of 2.8 percent per year and lackluster outcomes in many of LAUSD’s schools, fundamental changes within classrooms are clearly in order. The Independent Financial Review Panel found that “there may be lessons to be learned from the migration of students to charter schools” and “it is very important that the District carefully analyze charter programs and focus on which students are leaving and why” so that LAUSD can ultimately improve its programmatic offerings for families. More bluntly, the days of district monopoly and residential assignment are coming to an end, and if LAUSD is going to attract and retain students then officials must be more responsive to parent needs. Fortunately, numerous districts across the U.S. have already undertaken substantive reforms to adapt to this new operating environment, and LAUSD has much to learn from them. One prominent example is Denver Public Schools (DPS). DPS has adopted “portfolio management,” a model in which a district’s primary role is to approve operators, provide support, and evaluate school outcomes. Portfolio management is based on the belief that school-level autonomy drives performance by allowing school leaders and teachers to more effectively meet student needs. While traditional districts tend to prescribe a one-size-fits-all model by mandating inputs (e.g. staffing ratios, curriculum, etc.) portfolio management recognizes that each school has unique challenges and is thus more concerned with holding educators accountable for outcomes rather than how they operate. Ultimately, this helps to promote a diverse supply of schools that, when combined with a strong intra-district choice policy, can give parents more meaningful options that in turn help improve overall satisfaction and retention. As part of its strategic roadmap, The Denver Plan 2020, DPS is striving to have 80 percent of its students attending a high-performing school by 2020. New data by the advocacy group Parent Revolution show that 234 LA Unified schools scored in the bottom two levels — orange or red — for both English and math on the California accountability dashboard. In the 2016–2017 school year, 155,779 students were enrolled in those 234 schools. LAUSD has 34 schools that are red in both English and math. Last year those schools enrolled 26,400 students. At a minimum, 30 percent of LAUSD students could use a higher-performing school. Currently, LAUSD employs an antiquated school finance system. Instead of providing principals with actual dollars based on students, it allocates staffing positions that are determined using rigid ratios and district-wide average salaries. As Marguerite Roza of Georgetown University’s Edunomics Lab explains, “The district sends out teachers, principals, administrative assistants, lunchroom staff, librarians, and the like, and pays the bills out of the district coffers. Schools do not have their own bank accounts, nor do they receive reports that show the true costs of the resources that land in their buildings.” As well, according to Harvard researcher and former LAUSD budget director Jon Fullerton, the district’s budgeting systems “do not connect automatically with accounting systems, and both may be isolated from the human-resources systems that track who is hired, when, and for how much.” As a result, funding is delivered to schools in a manner that is non-transparent, inequitable, and less responsive to enrollment changes. This makes it difficult to provide leaders with valuable data that could help the district become more productive with its education dollars. To modernize its school finance system, LAUSD should allocate dollars on a per-pupil basis by adopting student-based budgeting, a funding portability framework that sends dollars to schools rather than staffing positions. This not only promotes equity and portability across schools within the district, but it also empowers principals to have more decision-making authority over how dollars are ultimately spent. Allocating funding to schools in per-pupil terms would promote greater efficiency by allowing dollars to grow and contract in direct proportion to student needs. In this way, student-based budgeting would allow principals to make their schools more responsive to parents’ needs, increasing the likelihood of higher enrollment and potentially generating new revenue at the school level. Moreover, when money goes directly to schools on a per-pupil basis, it becomes clear which schools are unable to financially sustain themselves and which schools may be candidates for consolidation to avoid insolvency. As part of this shift, LAUSD can also empower principals to purchase certain services from either the district or external vendors to optimize pricing and quality, which are often constrained by district contracts. This allows school leaders to make better use of their budgeted dollars while also helping to address central office bloat. Given LAUSD’s financial position and need to reduce personnel, student-based budgeting would allow school-level staffing based on the funding resources generated by the students in the school. Funding systems should be as simple and transparent as possible. Per-pupil funding should be based on the needs of each student. Per-pupil funding should follow the student to the public school of their choice. Principals should receive actual dollars—not staffing positions or other allotments—to spend flexibly based on school needs. Funding allocation principles should apply to all sources of education revenue. There has been a philosophical change: the principal is the CEO of the school. The central office is there to support them. We inverted the pyramid so that the principal is on top, telling the central office what they need, rather than on the bottom. That’s required a cultural change and huge structural changes in the district. LAUSD has already laid the foundation for this reform by piloting autonomous schools through its Belmont Pilot Schools Network, which started in the 2007–2008 school year. In the 2017–2018 academic year LAUSD allocates $46 million to 83 schools that receive their resources based on a per-pupil formula that is allocated directly to schools. In these schools, principals have more autonomy to purchase school-based staffing and differentiated district support. LAUSD should take the next step by adopting a district-wide program as numerous districts such as Boston Public Schools, Houston Independent School District, and New York City Department of Education have already done. goals, but would instead set the benchmarks and goals for the district. In order to measure progress and monitor performance, LAUSD should revamp its knowledge infrastructure to better integrate key information systems. This means going beyond merging budgeting, accounting and human resource data by ensuring that student enrollment and achievement data are also readily available for cross-referencing analysis. This would ensure that individual school leaders and district leaders have the tools necessary to make sound financial decisions that are driven by academic strategy and outcomes. For example, district leaders should know not only exactly how much is spent on each school but also how dollars are allocated across classrooms and courses. Disaggregating data to per-pupil terms at the classroom-level would help school leaders and district administrators assess the alignment of funding with strategic instructional intent and student outcomes, and more effectively consider trade-offs in how money is spent. This is especially important since research has shown that districts allocate funding in a manner that doesn’t align with stated priorities such as focusing on low-achieving students, a fact that leaders are often unaware of given antiquated accounting and budgeting practices. For example, a district may say its goal is to improve 3rd-grade reading and then spend all of its resources on high school AP classes. Without attaching school- and classroom-level expenditures to instructional priorities, school leaders, and districts have little information about how they are targeting resources to instructional priorities. Such transparency would help LAUSD’s current measurement of progress, as the district doesn’t track or publicly report its allocations at the school level based on student characteristics. As a result, education stakeholders and policymakers cannot easily determine if the new LCFF revenue, which the California Legislature intended to help high-needs students, is boosting spending in the schools these students attend. As Marguerite Roza noted in a recent report evaluating California’s LCFF revenue, “this lack of financial transparency makes it difficult to assess the degree to which LCFF is delivering—or not delivering—on the state’s pledge to drive resources to the highest-need students.” A more transparent student-based system would allow district leaders to track these dollars and make more informed decisions about how best to use the district’s scarce resources to improve student outcomes. Student-based budgeting has helped other districts determine which schools should be closed or consolidated and which schools should be expanded or replicated. For example, after adopting student-based budgeting, the Denver school board approved the closing of eight schools that were under-enrolled and low-performing. The board projected that the realignment of students from these schools to higher performing schools would achieve projected yearly operating savings of $3.5 million. Those resources were used to improve the education of students who were affected by the school closures, delivering additional resources to under-performing schools, and creating funding opportunities for new schools and new programs. In addition to the standard per-pupil revenue that followed students to their new schools, the district reinvested $2 million, or 60 percent of the savings from school closures, into the schools of reassignment. In this way, a student-based budgeting funding system is an important modern financial tool that can help right-size LAUSD’s financial ship. The Los Angeles teachers union announced Friday that it has scheduled a strike-authorization vote for later this month. A strike would not be automatic, even if a majority of members vote yes. But such a result would give union leaders the authority to call a strike without returning to members for another vote. Having members authorize a strike is a well-established pressure tactic, and once in a while, a strike does occur. United Teachers Los Angeles scheduled the vote after the state’s Public Employment Relations Board agreed with the union that talks were deadlocked. California’s public schools have enjoyed a remarkable restoration of funding since the bone-deep cuts they endured during the recession, but many are now facing a grave financial threat as they struggle to protect pensions crucial for teachers’ retirement. Over the next three years, schools may need to use well over half of all the new money they’re projected to receive to cover their growing pension obligations, leaving little extra for classrooms, state Department of Finance and Legislative Analyst’s Office estimates show. This is true even though the California State Teachers’ Retirement System just beat its investment goals for the second straight year. Some districts are predicting deficits and many districts are bracing for what’s to come by cutting programs, reducing staff or drawing down their reserves—even though per-pupil funding is at its highest level in three decades and voters recently extended a tax hike on the rich to help pay for schools. The situation could become even more bleak if California’s economy doesn’t keep growing. If there’s another recession – which economists say is increasingly likely given the record length of the expansion underway now – the higher pension payments scheduled could push some districts deeper into the red, Legislative Analyst’s Office data indicates. “Building maintenance could suffer, grounds care could suffer, class size could suffer, instructional coaches could suffer, athletic programs could suffer, technology could suffer, intervention programs could suffer” Fine said. The problems stem from the state Legislature’s reticence to mandate steeper payments into the California State Teachers’ Retirement System. The system was badly underfunded and careening toward collapse four years ago when school districts, teachers and the state all agreed to pay more to reduce its unfunded liability, which now stands at $107 billion. No matter how burdensome the larger and larger pension payments may be, actuaries say they’re necessary to protect teachers’ hard-earned retirement and prevent the system from running out of money. Teachers don’t get social security, and unlike firefighters or police officers, most retirees earn modest pensions of about $55,000 a year. The Brown administration has directed an additional $20 billion to the state’s public schools since 2013 and says districts have had plenty of time to plan for the pension payments ahead. But many school leaders and advocates want the state to invest even more, especially since California still ranks near the bottom in per-pupil spending compared to other states. Meanwhile, the state’s largest teachers union is downplaying the problem and encouraging its members to bargain for raises. California’s teachers may be among the nation’s most generously paid, but they say the money doesn’t go very far because the state’s cost of living is so high. School officials are left with a Gordian knot of politically charged problems, forced to make escalating payments into the pension fund while trying to elevate disadvantaged students’ sagging classroom performance, which remains among the country’s worst despite the state’s big investment in their learning through a policy championed by Brown. “We need to graduate more kids and close academic achievement gaps, but we can’t move the needle when costs are rising like this,” said Dennis Meyers, executive director of the California School Boards Association, who stressed that his group is not seeking to reduce teachers’ retirement benefits. Each of California’s school districts is bound to tackle these challenges differently, so CALmatters visited three of them whose circumstances are emblematic of what others across the state are experiencing. During those visits, we spoke with the people working to solve the problem. Fremont Unified devotes a greater share of its budget to salary than any other district in the state (discover the percentage devoted to salaries at each of California’s school districts here). So when the largest pension payments are phased in, Fremont will be hit especially hard. That means the district’s budget could face cuts even as enrollment in the Bay Area school system grows. Sacramento City Unified knew that larger pension payments were coming and saved money to prepare for them. Then the local teachers union criticized the district for hoarding cash and threatened to strike. Now, the contested funds are being used to finance a raise that teachers say is long overdue and that the county superintendent believes the district can’t afford. And in Los Angeles, growing demand for charter schools and a dwindling birth rate has led to declining enrollment in the district’s own schools, which means pension payments will rise even as the district’s state funding shrinks. School officials recently predicted that a quarter billion dollar budget deficit was just two years away. Raul Parungao’s distinctive grin and his cheery demeanor belie his concern about Fremont Unified’s finances. Situated between Oakland and San Jose in the pricey Bay Area, the school system pays its employees more than most. That makes it a desirable place to work but also means it will be hit especially hard when the largest payments required under Brown’s pension plan are phased in. Even though revenue is rising because enrollment is growing, the district must hire and pay more employees to serve them. And over the next three years, while Fremont predicts its revenue will grow by $26 million, a 7 percent bump, it also expects its employee pension and health care costs to climb by $14 million, a 23 percent surge. Meanwhile, Fremont’s teachers just won a small raise after months of protracted negotiations. The current pay scale is competitive, with veterans making $114,000 a year, but leaders of the local union say about half of teachers still don’t make enough to live in the district and must commute from up to an hour away. But no matter how tough it may be for the district to afford this 1 percent pay hike, teachers deserve one, said Victoria Birbeck, the union’s president. The district stretched to offer teachers a raise last year and even had to shift its budget by millions of dollars to accommodate that 2 percent increase, which came after a 13 percent bump over the prior three years. Plans to upgrade students’ textbooks and computers were postponed and class size for kindergarten, first and second grade students increased slightly. Given the district’s rising pension and other fixed costs, the new agreement’s $7 million price tag will be tough to accommodate. Still, Michele Burke, one of the district’s board members, acknowledged that for many teachers, $1 spent on pensions isn’t as good as $1 spent on salary. Sacramento Mayor Darrell Steinberg only worked with a few key players one weekend last fall when he helped broker a deal to avert a citywide teacher strike, and former school board president Jay Hansen was one of them. Hansen had tried for months to negotiate the terms of a pay increase for the city’s 3,000 teachers, but the district and leaders of the local teachers union were far apart and neither side would budge. An acrimonious relationship between the two camps was partly to blame for the impasse. At issue during the talks was the $81 million sitting in Sacramento City Unified’s savings account, a sum the district had built up over several years with spoils from California’s booming economy. The union said the money should go toward class size reduction and raises for teachers that would make the district a more attractive place to work. Sacramento educators are paid less than their peers in nearby districts, but they also receive more generous lifetime health benefits, records show. The district said that it had saved the money to help cover rising pension and employee health care costs in the lean budget years ahead. In the end, Steinberg helped craft an agreement that gives Sacramento teachers an 11 percent raise over three years. But just a few weeks after Steinberg announced the deal during a celebratory news conference on the steps of City Hall, Sacramento County Superintendent Dave Gordon delivered some bad news: the district can’t afford it. The district’s own budget offers proof of Gordon’s concerns. Even though Hansen had been the union’s adversary during months of stalled contract talks, he defended the district’s decision to offer teachers a raise, calling it “the right thing to do” despite the school system’s escalating pension and health care costs. “We did it anyway,” he added. “A strike would have been calamitous for everybody,” he said. And Sacramento isn’t the only place in California where teachers are thinking about a show of force. At least half a dozen other local unions fighting for higher wages have held labor actions in recent months. In an interview with CALmatters that union leaders cut short after refusing to answer some questions, Executive Director John Borsos rejected any suggestion that the district won’t be able to afford the contract it recently signed or that it ever claimed to have needed the money stockpiled in its savings account to cover rising pension costs. Gov. Jerry Brown promised his 2014 funding plan would shore-up California’s teacher pension system, but at least one young Los Angeles teacher, Josh Brown, says he’s not counting on it. The Oliver Wendell Holmes Middle School special educator is so worried about the system’s solvency that he has an alternative retirement plan: using a portion of his salary to invest in the stock market. The largest payments required under the plan will be tough for many districts to manage, but they’re going to be especially vexing for large urban districts like Los Angeles Unified, which lost 100,000 students in the last decade and expects to shed more (here’s the toll of that under-enrollment, school by school). That’s a problem because California’s schools are funded on a per-pupil basis and fewer students means less money. In Los Angeles, the swift enrollment decline is due to a dwindling birthrate and growing demand for charter schools, which are publicly funded but independently run, meaning their budgets are separate from the district’s. Over the next three years, the district anticipates its employee pension and health care costs will climb $90 million, a 5 percent increase, while its revenue dips about $270 million, a 4 percent decline. The result is a $258 million budget deficit in 2020 that the district can no longer paper over, push off or ignore. The district plans to tackle the deficit with a one-time $105 million bailout from the state and central office staff reductions. But observers says officials will soon need to consider some painful measures it has so far been able to avoid, like boosting high school class sizes or closing schools with dwindling numbers of students. At least 55 schools across the district are under-enrolled by a quarter, and ten of those are half empty, a CALmatters analysis of building capacity and enrollment data shows. “Our costs are rising, and as a result, there are hard choices and trade-offs to make each time we look at the budget,” said Scott Price, the district’s chief financial officer. Parent Paul Robak fears that if the district doesn’t tackle its budget problems soon, it could be taken over by the state. At a recent board meeting, he urged the members to reject a healthcare spending plan that would further squeeze the budget. The members listened and thanked him for testifying before approving the agreement. Board member Kelly Gonez also acknowledged the district’s budget woes and the pressure of rising pension and health care costs but said officials should be trying to ease the pain by finding new sources of revenue, not by making cuts. All but one other board member declined to comment. Even as a fiscal crisis looms, Los Angeles teachers are negotiating for a raise. United Teachers Los Angeles President Alex Caputo-Pearl declined CALmatters’ request for an interview. However, at a Pepperdine University event held before the state bailout was announced, he pledged to keep pushing for more money and predicted that the state would come through. Flooded with calls from anxious school officials, Sen. Anthony Portantino of La Canada Flintridge and several other Democrats pushed earlier this year for a fix that would boost districts’ funding by $1 billion a year. In the end, Portantino convinced Brown to include about half as much in the state budget he signed a few weeks ago. He insisted that the money be “flexible,” meaning districts may use it to cover rising pension costs or for anything else. But California’s schools are still underfunded compared to other states, and to better fulfill their responsibility to students and taxpayers, that must change, he said. In the meantime, Fine hopes a recession doesn’t strike soon and that districts can manage their budgets without needing to make cuts or send out pink slips. He was a deputy superintendent in Riverside during the Great Recession and remembers how painful it was to carry out round after round of layoffs. A new study raises fresh concerns about the giant Los Angeles Unified School District and whether it shows good faith in its dealings with struggling schools in poor minority communities. The Los Angeles-based Parent Revolution group, which focuses on improving education and increasing educational opportunities for poor minority students, analyzed 44 LAUSD schools with weak test scores last school year. At these schools, only 20 percent of students met or did better than state math standards and only 28 percent in English. Yet last school year, 68 percent of teachers in these schools were not subject to official evaluations – either through oversight or via exemptions ordered by their principals. Of teachers who were evaluated, 96 percent were found to meet or do better than district performance standards. Over the past three school years, the figure edged up to 97 percent getting positive evaluations – meaning only about one in every 30 evaluated teachers is found wanting. The findings parallel those that emerged from the landmark Vergara v. California lawsuit, in which nine students from state public schools represented by civil-rights attorneys hired by the Students Matter group alleged five state teacher job protection laws were so powerful that they had the unconstitutional effect of keeping incompetent teachers on the job and funneling them toward schools in poor communities. Evidence presented by the plaintiffs in the case showed that only 2.2 teachers on average are fired each year for unsatisfactory performance in a state with 275,000 teachers at its public schools. The case’s primary focus was on Los Angeles Unified. In a twist that few expected, some of the most powerful testimony against the teacher protection laws came from then-LAUSD Superintendent John Deasy. He testified in early 2014 that even if a teacher were “grossly ineffective,” it could cost the district millions in legal bills to fire the teacher. Later that year, state Judge Rolf Treu agreed with the plaintiffs that the five teacher protection laws unconstitutionally deprived the students of their right to a good public education. Treu likened the laws’ effects to those of segregation before the U.S. Supreme Court’s 1954 ruling in Brown v. Board of Education. Treu’s decision was overturned on appeal on the grounds that the trial failed to clearly establish a factual nexus between student performance and the job protection laws. But education reformers were somewhat heartened by what happened next. Three members of the California Supreme Court wanted to hear an appeal of the appellate ruling, suggesting at the least some interest in Treu’s reasoning, which was mocked as novel and weak by attorneys for teacher unions. While they were voted down by the state high court’s other four justices, they could be a factor in future litigation. As for Los Angeles Unified, litigation over school practices affecting minorities and high-needs students has been common for decades. In September 2017, for a recent example, the district reached a $151 million settlement in a lawsuit filed by the ACLU over the improper diversion of Local Control Funding Formula dollars that were supposed to be used to help struggling students in poor communities, especially English-language learners. LAUSD was also the target in 2010 of what a federal government statement called “the first proactive civil rights enforcement action taken by the Department of Education under the Obama administration” – prompted by what then-Education Secretary Arne Duncan called the district’s failure to adequately educate many Latino and African-American students. The case was settled in 2011 after the district agreed to make several substantial changes meant to improve these students’ performance. But evidence presented in the Vergara case showed no subsequent gains by these student groups. Los Angeles Unified has 640,000 students, making it by far the largest school district in California. Only the New York City school system, which has about 1 million students, is larger in the U.S.